After weeks of some of the highest water we’ve seen, it was about time for us to have some low water again. 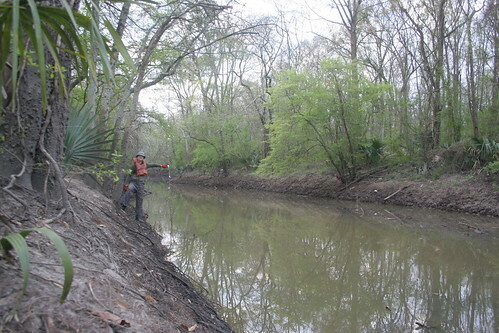 We knew going in that we’d hit more wood with the bayou down, and it certainly did not disappoint. It was a pleasant morning when we arrived at Highland Road Park. The chance of rain had been dropping almost as fast as the water level, and it was positively spring-like out there. Of course, this *is* Louisiana, so the arrival of warmer weather heralds the arrival of massive swarms of blood-sucking mosquitoes. We were certainly remembering with longing the mosquito repellant we did not have with us. While the insect situation had degraded significantly since the halcyon days of ice storms and snow, the water temperature was much more comfortable, having reached a not-quite-balmy 66°F as measured by my trusty waterproof infrared thermometer. Such a handy little device (sized for a key ring and only $20!) was especially convenient given how far down the bank the water had retreated. We certainly were not launching easily from the top of the bank this time. It was the full drop down to the mud and logs below. Someday we’ll have a nice slope to help launch and recover canoes and kayaks, but in the meantime, it’s not *that* bad… provided you have rubber boots that fit well enough the mud won’t steal them. Heading downstream, everything was mostly open for almost the first two miles before we encountered our first small problem area between the original #10 and #11. Things have certainly shifted a bit from the original scouting run, but that’s a good thing. It means the bayou isn’t completely choked as it once was, but it also means that there are still surprises here and there. In the first two miles, there was really only one small shallow spot where a downed tree had previously been. If it’s a problem later, we can easily pull the silted-in branches out with a little rake work. There were a few relatively small issues before the second power line crossing, but once we made it there, we were in uncharted territory. We had not had much opportunity to work in low water beyond that point, so it was unsurprising when we started hitting lumber. Downed tree trunks which had previously been under too much water to notice were now quite accessible, so we made multiple stops to cut as necessary and winch things around. During one of the stops, a kayaker caught up with us and joined up for much of the day. The work wasn’t what he’d expected or planned for, so he had to settle for helping out from his kayak while we went all-in with waders and a complete disregard for getting completely covered in muck. After weeks of working the “easier” log-and-flotsam aspect, it was back to hard manual labor, and in a way, it was fun. 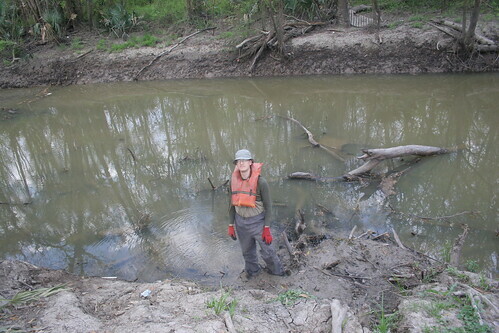 We have not yet had a fully-accessible bayou over a long summer, so we can’t say for sure how much of the vast collection of logs and silted-in branches on the bottom are going to need to be dealt with. We saw (and hit) more this weekend than we have in a while. Some of that was the water level, and much of it was that the lower section has collected much more debris over time. Compared to the giant logjams we’ve already fought and vanquished, a few shallows to free up is not going to terrify us too much. It does feel a bit like Zeno is the project manager, as no matter how much work we’ve done, we’re still only halfway there, but on a living bayou, there’s always going to be that Columbo-style “one more thing…”. While there are some silty shallows and a good number of things to bump, there was only one last significant area of accumulated flotsam. (Spring special: now with more duckweed!) We broke most of that free, although we ran low on daylight and did not have a chance to work on the downed tree that caused it. With daylight saving and hard labor, the day already seemed quite long, but when we saw an alligator slide off the bank and into the water not too many yards from the spot, calling it a day and heading back seemed like a perfectly logical suggestion. Just before we called it, a couple guys coming upstream came upon us and had a nice little conversation. They’d also heard about us, which might start to go to your head if you weren’t dog-tired and coated head to toe in bayou muck. On the way back, we took a moment to stand up in the canoes as we passed under the bridge about a third of a mile downstream from the launch. There was absolutely no need to duck this time. As we paddled the last leg, we noticed some wheels in the water. They looked a lot like the tires we’d previously collected and had temporarily left staged at the launch point while we collect the rest. 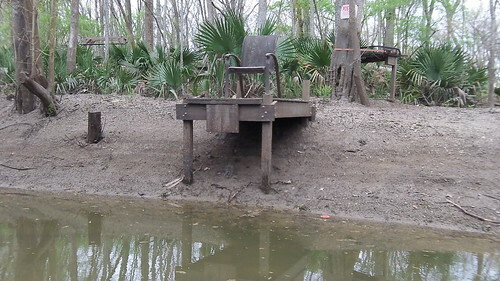 Then we noticed one of the large plastic “pallets”, and as we approached the launch point, there was the rest of the large item collection that was formerly neatly stacked beside the brush that borders the bayou bank. 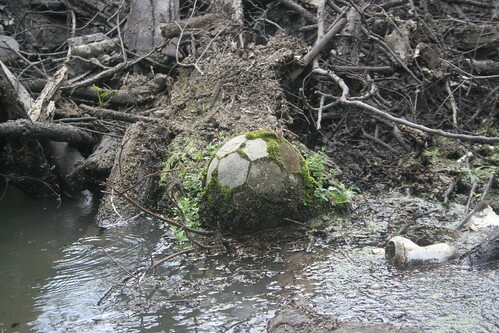 Someone had taken it all and thrown it off the bank and back into the bayou. There was also fishing line strewn all about. Tired as we were, we collected all the tires and the pallets and carried it all back up the high bank to be neatly stacked again. We were not pleased by the situation, but what do you do but hope that some guy fishing isn’t going to make a habit of making you play Sisyphus. Oh, and speaking of the bank, here’s the hanging chain gauge to give you an idea of the water level. The white T being pointed to marks the bottom of the bridge, with the markers above and below it marking one-foot increments. (There’s also a white X piece marking the *top* of the bridge — if you’re at the chain gauge and you don’t see that, you may have had to launch from the parking lot.) 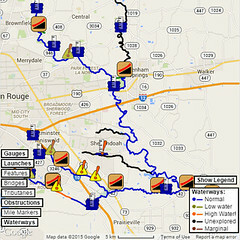 Over the weekend, the water was between 5-1/2 and 6 feet below bridge level. All in all, it was another good day. We got quite a bit of work done moving big logs and tree trunks that were finally accessible. While the lower water has made it abundantly clear that there’s plenty of work left to make the bayou what we want it to be during low water, we can also say with utmost conviction that this is the best we’ve ever seen it out there. 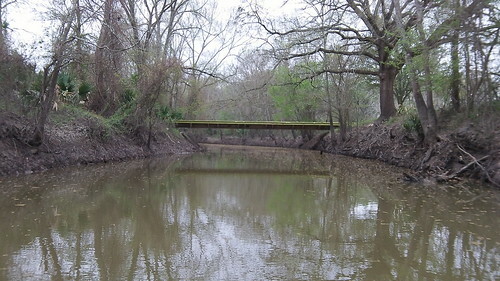 Paddling between Highland Road Park and Bayou Manchac is no longer an impossible dream. Now it’s just a nice day on the water.